OWH Stars and Stamps (Our OLD blog! ): We wish you a Merry Christmas! And a crafty new year! Also...we had a bunch of folks asking if we can extend the "All about the boyz" challenge from yesterday---your wish is our command, since it's Christmas! That challenge is open til Sunday night, and you can submit multiple entries for it. (Just use InLinkz separately for each one - you'll have to do separate blog posts to get InLinkz to accept them.) See yesterday's post for details and the digi freebie. I saw this post and had to write our son Jared is on his way to this exact spot. 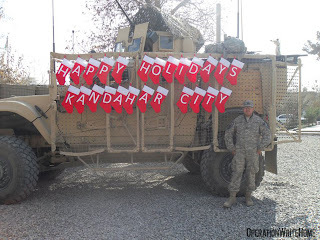 First he joined the Army and they took him on Mothers Day and now to Kandar for Christmas. A Mothers heart is breaking, a wife's heart is acheing and a son's heart is missing his Dad. But in every nights prayers is a request that all our service men and women will be home soon. This is our first tour of duty for our family and it makes it alittle easier knowing there is such caring people out there like you guys. So happy New Years and know how much you mean to us. This year I was also in Kandahar for the Dutch Army. Now I'm back in the Netherlands and found this great project to send handmade cards to the American Troops. I like it very much so I started to make a lot of cards. I hope I can send them to the States this week so the collector can sent them to you in Afghanistan.